We are extremely excited to present one of our favourite modern-day classics. 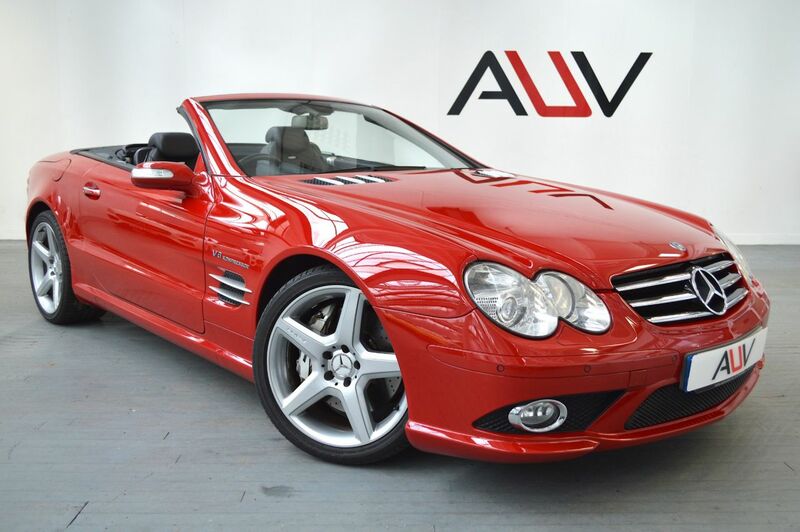 This is an extremely rare last of the line 2007 Mercedes SL55 AMG with the upgraded 5.5 litre supercharged engine producing 517 bhp instead of the normal 497bhp, with 720NM torque. This allows for a 0-60 of 4.5 seconds and a top speed of 155mph (restricted). These pretty supercars were replaced in 2008 with a rather ungainly looking successor with the poorly regarded normally aspirated 6.3 V8. The new engine was so poorly received that Mercedes were forced to reintroduce the 5.5 supercharged engine in 2009. This car comes in one of the rarest colours; fire opal red. This was the promotional colour used in the USA to advertise the SL55 on television. In the five years of production nearly all SL55 vehicles were supplied in silver or black with a small handful in Champagne and even a smaller number in red. In 2007 as a farewell to the R230 SL Mercedes carried out a final facelift introducing the Evolution Body kit and five spoke Alloys. This particular car in addition to these style upgrades was specified with numerous extras including, panoramic roof, massage seats, air suspension, AMG Body control adaptive dampers, Bi Xenon lights ,Harmon kardon sound, keyless entry & go and even an integrated Alpine DAB radio tuner. This car with all its optional extras originally cost over t£120,000. Before you reserve a vehicle we ask that you read both our Business and Warranty conditions in the 'Terms' tab above. Specialists in vehicle financing we can offer our clients market leading, bespoke funding packages. Finance examples are subject to status, regulated and monitored by the FCA. Goods and services are supplied by Approved Used Vehicles Ltd. For further information on how to reserve this vehicle or tailor your finance package please call us on 01455 446505.